This was one of those photos where everything just worked. I took this on a Friday morning. Two days prior my wife and I were out biking around the neighborhood with our kids and we went past a pretty large field full of yellow and red flowers, and at the time I told her that I’d like to return the next morning to take a picture. We talked about how the red flowers might really stand out against the yellow ones, and in the right light it might look pretty cool. Sunrise was about 6:20am and I knew if I left for work at 6:45 I would have time to drive past this field, hop out, snap a few pictures before the sun was too high in the sky, and then get to work right on time. A few minutes later and I just wasn’t having much luck. I had plenty of shots of flowers but nothing that really stood out to me though perhaps I might share one here in the coming weeks anyway. I liked the lighting, I liked the colors, and the dew drops covering the grass were a really nice added touch that helped lend some unexpected sparkles to the pictures. The problem wasn’t necessarily finding a good scene, it was finding a good composition. How could I use the various elements to create a solid photograph? And that’s when I saw this butterfly. I now had a clear subject and focal point for a photographic composition, and I carefully made my way over to the place it was resting in order to take a couple of pictures before it flew away. Once again Live View and the articulating screen helped immensely, and I took several shots at various apertures in order to play around with background blur and overall subject sharpness. No matter what I wanted the butterfly to be as sharp as possible so I shot some at f/1.8, others at f/2.8, and a couple more at f/4 just for good measure. What I didn’t expect when I loaded the image into Lightroom was how much I liked the bright spots of light thanks to the dew on the grass. 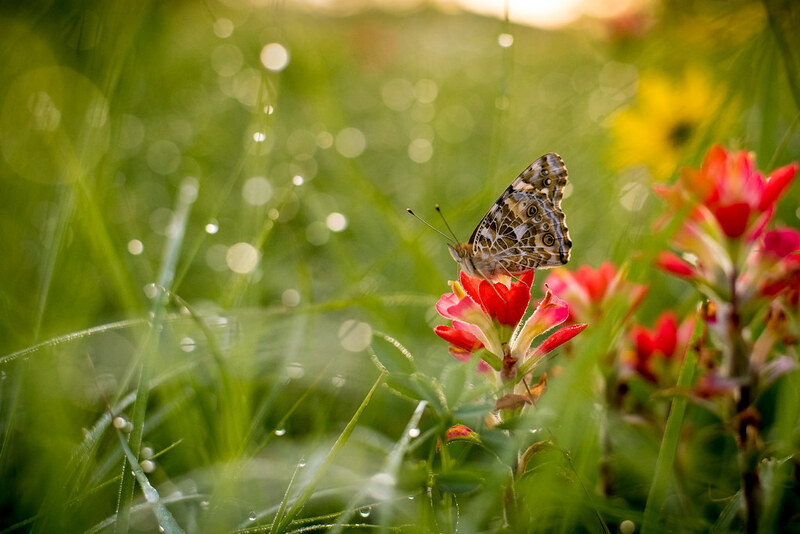 They added so much to the image that I ended up choosing this as my favorite picture form the morning even though the butterfly is just a tad soft compared to the shots at smaller apertures. Even stopping down to f/2.8 had a hugely noticeable effect on the bokeh balls (is that what they’re called?) on the left side of the composition, and that was a compromise I just didn’t want to make. Man! What a difference the dew drops made. The colors and the bokeh balls give this image a magical presence. I have two FB friends, both early birds, who take brilliant early morning images. Both know how to play with the light and the dew drops. What a beautiful image. It all works together to give a dreamy feel to the image. Nice work! Excellent composition and colours. The butterfly commands your attention in the photo despite all the other elements.